Mukesh Sharma: Karate and Taekwondo player of Kalimpong have come with flying colour in the different tournament held at Sikkim and Darjeeling on 28th and 29th May. Darjeeling Gorkha Karate Association, GTA Karate Team bagged 2Gold, 2Silver and 11 Bronze Medals in 19th All India Wadokai Karate Championship held on 28-29th May 2016 at Paljor Stadium, Gangtok ,Sikkim . Hosted by Sikkim State Karate-Do Association.Karate Students of Vrindavan School Noyo Sherpa won 1Gold &1Bronze Medal, Selbi Selden Bhutia won 2 Bronze Medal,Sherap Laden Lepcha won 1 Bronze Medal,Aakriti Dangal won 1 Bronze Medal, Yachana Chettri won 1 Bronze Medal Mr.Shaiva Shrestha won 1 Silver Medal, Priyadarshan Thapa of From Rockvale Academy won 1Gold Medal,Prabhat Gurung won 1 Bronze Medal and Kritagya Pradhan won 1 Bronze Medal..Manish Chhetri won Silver Medal, Mr.Prince Raj Gupta of Mt.Star Academey, Mr.Chogyal Bhutia of Kumudini Homes won 2 Bronze Medal each. 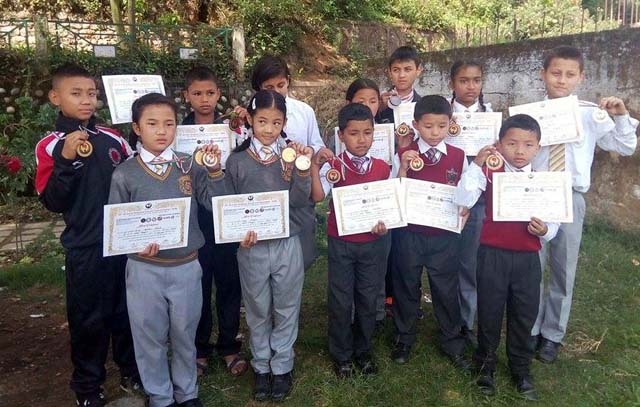 Meanwhile Kalimpong Taekwondo Dojan player too have been successful in bagging 5 gold medals at 2nd Darjeeling District Taekwondo Championship. The Championship organised by Darjeeling District Taekwondo Association was held at Capital hall on 28th and 29th May. Master Trilok Subba who led his 5 player have each of bagged gold medals. Sidharth Pradhan, Binay Rai, Pritesh Rai Jitendra Limbu of SUMI School along with Anupama Subba of Girls Higher Secondray School have won gold. Kalimpong player in both field have now been regularly bagging medals in district , state National and international levels .